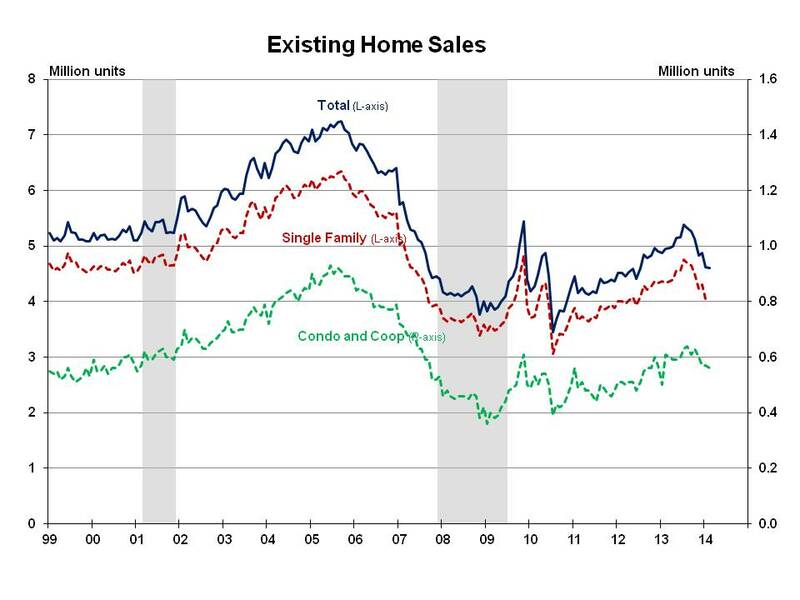 Existing home sales decreased 0.4% in February, and fell 7.1% from the same period a year ago. The National Association of Realtors (NAR) reported February 2014 total existing home sales at a seasonally adjusted rate of 4.60 million units combined for single-family homes, townhomes, condominiums and co-ops, down from 4.62 million units in January. The West and South increased by 5.9% and 1.5% respectively from January, while the Midwest and Northeast decreased 3.8% and 11.3% respectively. Year-over-year, all regions decreased, ranging from a slight 0.5% in the South to 12.7% in the Northeast. Seasonally adjusted condominium and co-op sales fell 1.8% in February, and were down 8.2% from the same period a year ago. First-time buyers comprised 28% of February 2014 sales, up from 26% in January, but down from 30% last February. The January first-time buyer share of 26% was the lowest since NAR began reporting that share monthly in October 2008. The historical average first-time buyer share is about 40%. Tight lending conditions continue to buffet first-time buyers, and NAR points to high levels of student debt as an important factor. Total housing inventory increased 6.4% in February to 2.0 million existing homes. At the current sales rate, the February 2014 inventory represents a 5.2-month supply compared to a 4.9-month supply in January, and a 4.6-month supply of homes a year ago. On a positive note, NAR also reported that the February median time on market for all homes was 62 days, down from 67 days in January and 74 days during the same month a year ago. NAR reported that 34% of homes sold in February were on the market less than a month, compared to 31% of all homes sold in January. As the market heals, the share of distressed sales increased for a second consecutive month to 16% in February from 15% in January, but was down from 25% a year ago. Distressed sales are defined as foreclosures and short sales sold at deep discounts. All cash sales were 35% of February transactions, up from 33% in January and 32% the same period a year ago. Individual investors purchased a 21% share in February, down from 20% in January and 22% a year ago. Some 73% of February investors paid cash, up from 70% last month. The median sales price for existing homes of all types increased to $189,000 in February from a downwardly revised $187,900 in January, but was up 9.1% from a year ago. The median condominium/co-op price was $187,900 in February, down from a revised $187,900 in January, but up 9.8% from February 2013. The December Pending Home Sales Index fell sharply by 8.7% in December, and then ticked up a tiny 0.1% in January. With much of the decrease attributed to weather, it was expected that January and February existing home sales would also fall sharply. Despite the increase in the February investor share, the 2013 run up of existing home prices will eventually make these homes less appealing for investors, and a future withdrawal of that demand will further depress existing sales. While existing home sales are down year-over-year, new home sales continue to post year-over-year gains (tempered by recent weather impacts) as investor activity cools. January 2014 new home sales hit a seasonally adjusted rate of 468,000 which was up from 458,000 during the same month a year ago. Last month NAR reported that higher flood insurance rates presented a new headwind for just under a tenth of the market, and that 40,000 home sales were either cancelled or delayed because of higher flood insurance rates. NAHB applauds the Senate for joining the House by passing H.R. 3370, the Homeowner Flood Insurance Affordability Act, which will moderate the immediate impact of flood insurance premiums on home owners.